Tapirs inhabit jungle and forest regions of South America, Central America, and Southeast Asia. There are four species of Tapirs: the Brazilian tapir, the Malayan tapir (which we find in Indonesia), Baird’s tapir and the Mountain tapir. All four species of tapir are classified as endangered or vulnerable. Their closest relatives are the other odd-toed ungulates, including horses and rhinoceroses. Size varies between types, but most tapirs are about 2 metres long, stand about a metre high at the shoulder, and weigh between 150 and 300 kg. Coats are short and range in color from reddish-brown to grey to nearly black, with the notable exceptions of the Malayan Tapir, which has a white saddle-shaped marking on its back, and the Mountain Tapir, which has longer, woolly fur. 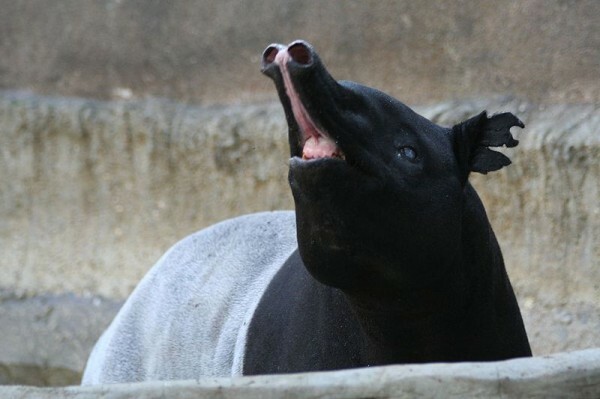 All tapirs have oval, white-tipped ears, rounded, protruding rumps with stubby tails, and splayed, hoofed toes, with four toes on the front feet and three on the hind feet, which help them walk on muddy and soft ground. Baby tapirs of all types have striped-and-spotted coats for camouflage. Females have a single pair of mammary glands.